I remember the first time I wrote about LaCie. I had the pleasure to review Andre Silva’s LaCie Float design, and when I first saw it, I thought, what the heck? How can someone dream up something like this?! But the downside is that it’s still just a concept of Silva’s creative mind. But now, LaCie has developed two hard drives fit for our dreams, but slated to hit the market: the LaCie Porsche USB 3.0 hard drives. The LaCie Porsche Design Desktop Hard Drive and LaCie Porsche Design Mobile Hard Drive are both powered by USB 3.0, and feature an elegant gray aluminum case that’s totally scratch-resistant. The simple yet stylish case uses the same design sensibilities as of one of your favorite high-end car brands, Porsche, thanks to their collaboration. The result is extremely classy HDDs that no fashionable techie may be able to resist. Aside from being encased in a 3mm aluminum casing, the LaCie P’9230 is a desktop hard drive that lets you transfer your files 10 times faster than the usual HDD. An LED has been specially situated where the user can easily see the power activity of the device. 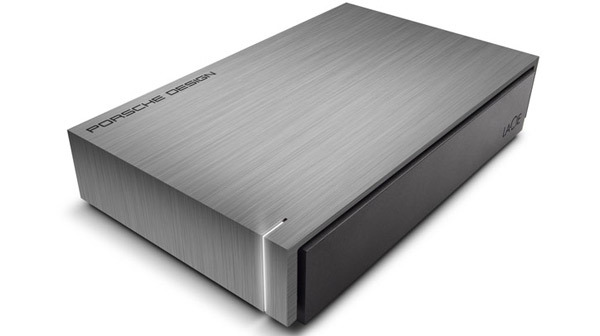 The LaCie Porsche Design Desktop Hard Drive can transfer a 700MB video file in just seven seconds. Meanwhile, the new LaCie P’9220 is a super portable external hard drive that’s as exceptional as the desktop hard drive version, transferring your data in merely 8 seconds! With superb speed and an attractive physique, the P’9220 is the perfect companion for an on-the-go creative professional. Both LaCie hard drives are packed with various software including Automatic Eco Mode, and the Wuala Online Storage. Currently, the LaCie Porsche 3.0 drives are only supported by Windows systems. However, the company is actively working on Mac versions that are said to look better with a slightly better finish to match Apple’s sophisticated yet simple aesthetic. However, as Apple doesn’t support USB 3.0 yet, your LaCie Porsche hard drives (Mac version) will be stuck with USB 2.0. Both the P’9220 and the P’9230 are available in stores, and online through LaCie and its authorized dealers. The LaCie desktop hard drive is sold for $119.99 for the 1TB capacity, and $159.99 for the 2-TB capacity. The portable hard drive, on the other hand, is sold for $104.99 for the 500-GB capacity and $159 for the 1TB capacity. Are you impressed by the LaCie Porsche USB 3.0 hard drives or do you think that it’s all about appearances? Tell us what you think! This entry was posted in Articles, External Hard Drive, Flash Memory Future, LaCie, LaCie Porsche USB 3.0 Hard Drive, LaCie USB 3.0 Hard Drives, Portable Hard Drive, SuperSpeed USB 3.0, USB 3.0, USB 3.0 Express SSD, USB 3.0 Hard Drives, USB Devices, USB Storage Drives, USB Technology and tagged Andre Silva LaCie Float design, Automatic Eco Mode, Desktop Hard Drives, desktop HDD, LaCie, LaCie hard drives, LaCie P9220, LaCie P9230, LaCie Porsche, LaCie Porsche 3.0 drives, LaCie Porsche Design Desktop Hard Drive, LaCie Porsche Design Mobile Hard Drive, LaCie Porsche USB 3.0 Hard Drive, LaCie Porsche USB 3.0 Hard Drives, Mobile Hard Drives, mobile HDD, portable external hard drive, USB 3.0 Hard Drive, Wuala Online Storage. Bookmark the permalink.